The Intempco LTX20 series fuel capacitance level transmitter is designed to measure level of fuels and oils in metallic and non-metallic tanks. The probe measures level by measuring the change in capacitance as level changes in the tank. The micro-processor based electronics converts this capacitance change into a linear, highly accurate 4-20mA signal. The LTX20 includes a standard 4-20mA loop powered LTX transmitter, a concentric 0.75 -inch diameter concentric shield with ranges up to 10 feet. Probe material is SS316. The LTX20 is designed for tanks which have fitting connections of 3/ 4” NPT or larger and in applications where the liquid is relatively clean or non-clogging. An excellent application for the LTX20 are stationary or mobile generators. 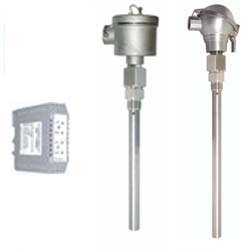 This level sensor is shock resistant and very rugged. There are no moving parts. To isolate for ground loops, a non-conductive reducer ( such as PVC) can be used between the tank and the 3/4” NPT fitting of the LTX20.